Not to be confused with Simeon (son of Jacob). In some Christian traditions, this meeting is commemorated on February 2 as Candlemas, or more formally, the Presentation of the Lord, the Meeting of the Lord, or the Purification of the Virgin. His prophecy is used in the context of Our Lady of Sorrows. Simeon is venerated as a saint in the Roman Catholic, Eastern Orthodox and Oriental Orthodox traditions. His feast day is October 8 in the revised Martyrology of the Roman Catholic Church. The text suggests that Simeon was the officiating priest. Some writers have identified this Simeon with Shimon ben Hillel, although Hillel was not a priest. Simeon senex (Simeon the old man) occurs in some Latin texts and hagiographies. The events in the life of Saint Simeon the Righteous are observed on both February 2 and 3. The observances of the first day center around memorializing the act of Mary undergoing an act of ritual purification, and presenting Jesus, her child, to the Temple, a feast day known as the Presentation of Jesus at the Temple. 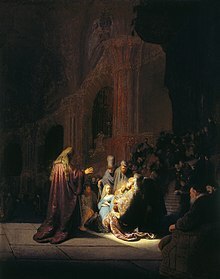 Since this day focuses more on Jesus and Mary, the observation on February 3 is specific to St. Simeon, who was allowed to die after seeing the Christ (or Messiah) born of a virgin. In Christian tradition, the day of a saint's death is often celebrated as the saint's feast day. In the liturgy of Evening prayer in the Anglican communion, Anglicans recite the Nunc dimittis – or sing it in Evensong in the canticle known as the Song of Simeon – traditionally, every evening. It is also used in the Roman Catholic Compline and Orthodox Vespers. The Nunc dimittis has been set to music by many notable composers, such as Rachmaninoff (All-Night Vigil). While both the Catholic and Orthodox Churches agree on the setting of the date of Candlemas on the 40th day after Christmas (in accordance with the Mosaic Law), the difference in the marking of Christmas – December 25 results over a theological dispute related to the adoption of the Gregorian calendar over the older Julian Calendar. December 25 currently occurs 13 days later on the Julian Calendar than on the Gregorian calendar. The Gregorian revision of the calendar occurred in 1582, well after the Great Schism between the Eastern and Western Christian churches in 1054. ^ The Rabbinic Traditions about the Pharisees Before 70: The houses – Page 217 Jacob Neusner – 1971 "It is not integral to the story, and some say is immediately corrected : Hillel was not a priest (as if Yohanan was! ), and therefore could not have been the master to whom the story is assigned. Perhaps someone had a special interest in .."
Herbermann, Charles, ed. (1913). "Holy Simeon" . Catholic Encyclopedia. New York: Robert Appleton Company.